Of the General Assembly’s many missteps in the 2016 Budget, one of the least noted – but most baffling – has been the $5 million appropriation to the North Carolina Education Endowment Fund. The North Carolina Education Endowment Fund was created in the 2014 budget at the urging of Lt. Governor Dan Forest. The Lt. Governor’s idea was that the sale of specialized license plates and donations from private industry would generate sufficient revenue to fund performance pay plans for teachers. To provide a sense of scale, appropriations for North Carolina’s last statewide performance pay plan, ABC Bonuses, ranged from $70 million to $120 million between FY 97-98 and FY 08-09. That’s a lot of license plates. 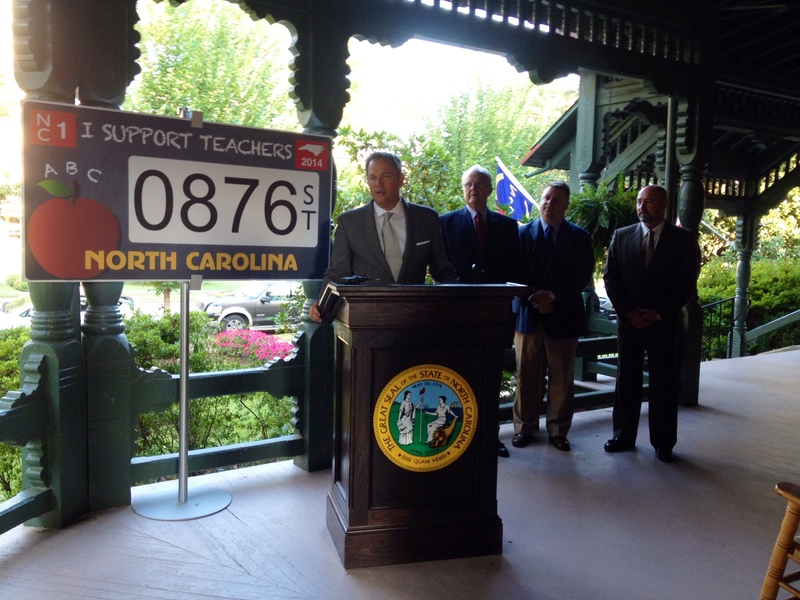 In fact, at $20 per plate, 3.5 million North Carolina drivers – approximately half of all drivers – would have to buy an “I Support Teachers” license plate every year in order to generate what was needed in the smallest years of the ABC Bonus program. The Lt. Governor was actually aiming even higher, hoping that the Endowment would be large enough to be self-funded, funding performance pay plans off just the interest generated by the Endowment. At an interest rate of 5% per year, the Endowment would have to have a balance of approximately $1.4 billion (70 million license plates) to generate $70 million per year. Predictably, the Education Endowment Fund has been a failure. Despite an active marketing campaign from the Lt. Governor’s Office, they were unable to collect the requisite 500 signatures to begin the production of the specialized plates. According to the NC Office of State Budget & Management, donations have generated a mere $84,554. Combined with a $1 million appropriation in the 2014 Budget (and the interest thereon), the Endowment had a balance of $1,095,456 as of May 31, 2016. Despite this track record of failure, the General Assembly has decided to keep the Endowment alive, making a $5 million nonrecurring appropriation to the Endowment in the 2016 Budget. Barring a special session, these funds will provide no benefit to teachers in FY 16-17. The 2014 law prohibits the funds from being used without an act of appropriation by the General Assembly. Of course, there are many beneficial, competing uses for these funds. The funds could have supplemented school district spending on textbooks or supplies, both of which remain well below pre-Recession levels. The Community College System only received $6 million of its $15 million budget request for equipment. Perhaps $500,000 of these funds could have been used to pay for the State’s HB 2-related legal costs, rather than reducing funds for the NC Emergency Disaster Fund. The possibilities are nearly infinite. So why did the General Assembly decide to make this appropriation? Emails to Senators Apodaca and Barefoot have gone unanswered. However, a look at other budget items indicates a potential motive: to shrink spending. For example, the 2016 Budget creates the Opportunity Scholarship Grant Fund that is expected to siphon off over $100 million per year from availability. The Budget provides $474 million to the Savings Reserve. $150 million has been placed into a Medicaid Transformation Fund. The Medicaid Contingency Reserve holds another $186 million. A $4 million recurring appropriation was established for the Ferry Systemwide reserve account. Whether intentional or not, these appropriations diverting funds away from current operations are part-and-parcel with efforts to simultaneously reduce available revenue, such as the (thankfully) failed efforts at amending the constitution’s income tax cap at 5.5%. Regardless of the motive, it is difficult to see the $5 million appropriation to the Education Endowment Fund as anything but bad policy-making. At the current rate of accumulation, the Education Endowment won’t have $70 million until 2044, and won’t achieve self-funding status until the year 2088. Even if the $5 million Education Endowment appropriations represents an honest attempt to provide a source of funds for performance pay plans, it ignores a robust body of evidence that performance pay plans don’t work. Policymakers would best be advised to abandon the laughably misguided Education Endowment plan, and instead focus on serious plans to raise base teacher pay to levels that are competitive with other industries. Could the Lt. Governor’s lack of arithmetic ability be attributed to the home schoolers version of the 3Rs; Readin, Rightin and Religion?